Cells throughout your body work around the clock, even when you're sleeping. Clearly, they need a steady supply of energy to keep going. To function, they rely on glucose, a simple type of carbohydrate. Glucose enters your bloodstream until the hormone insulin comes around to help cells use or store the circulating glucose. Your blood sugar may go up a bit after eating, but if it's still high four hours after your meal, or if it drops too low, something is awry in your body. Normally your blood sugar should remain between 70 and 130 milligrams per deciliter, according to the American Diabetes Association. This range is for any random time throughout the day, before or after meals. After a long fast, such as after a night's sleep, it's normal for your glucose to be on the lower end of that spectrum -- 70 to 100 milligrams per deciliter. If you're generally healthy or are properly managing your diabetes, your blood glucose should fall between 90 and 130 milligrams per deciliter four hours after eating. If you're not diabetic, your sugar could even go as high as 140 milligrams per deciliter after meals. Of course, if you are a diabetic, your blood glucose could rise even higher -- 180 milligrams per deciliter or above, even several hours after eating. It's not typical for your glucose to remain elevated four hours after eating. By then, insulin should have done its job and made sure that all of that extra glucose was used up. So if your blood sugar is still high hours after eating, it could be a sign that you have diabetes. Or if you have already been diagnosed, the dosage of your insulin or other diabetes medication might be off. Elevated glucose can also stem from an infected pancreas, an overactive thyroid and certain types of tumors. Having low blood glucose after eating, especially four hours later, isn't healthy either. If you are diabetic, it's possible that you took too much insulin or other diabetes medication. Whether you are diabetic or not, chronic low blood sugar might mean that you're not eating enough. Decreased glucose levels could be a sign of a dysfunctional pituitary gland, underactive thyroid or rare type of tumor in the pancreas that leads to increased insulin production. Why Would You Have High Blood Sugar If You Have Not Eaten in 12 Hours? 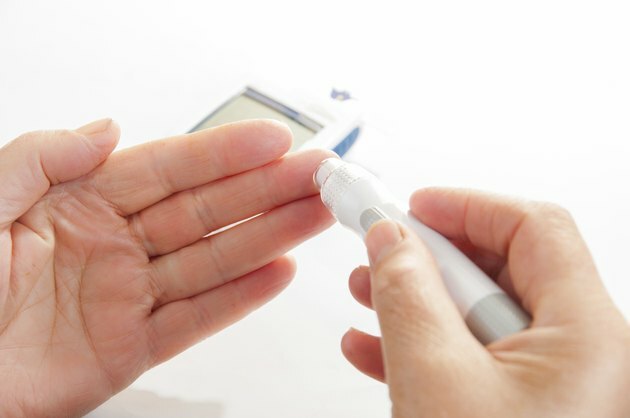 What Is Considered a High Blood Sugar Level for a Diabetic? How Fast Should Blood Sugar Come Up After Drinking Orange Juice?